Whether you are an avid camper, farmer, or a survival maniac, owning a machete will certainly come in handy in your day to day activities. Machetes serve as an exquisite tool that not only works as a perfect harvesting knife to clear weeds and dig up soil for planting but also comes in handy for camping and other outdoor activities. As minute as these tasks may seem, to get the best of a machete, there are certain outstanding features one should have. This great read will serve as a guide providing in-depth information on the best machetes out there along with the various types and their features. The Gerber Gator Machete might as well be described as a versatile, multi-purpose two-edged machete that doubles as a blade on one side and a saw on the other. Talk about carrying out multiple tasks with one effective blade in hand! The sharp surfaced blade measures 15- inches while the saw blade measures 18-inches, both will easily be swung into action by the ergonomic rubber handle. The blade itself is made from top quality, strong carbon stainless steel that is suitably coated with black oxide which delivers an attractive black look while keeping the reflectivity low. 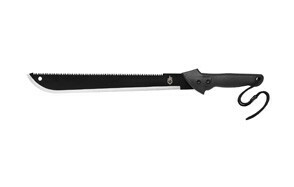 The Gerber Gator will have your trees trimmed and vines plus garden properly weeded. It may be a wonder how such a simple looking tool can achieve so much – this masterpiece swings and hums swiftly in your hands convincing all of its sharp and expedient properties. When using a machete, the grip on the handle is extremely important, especially when used to clear bushes or freeing up a pathway. Most farmers would probably admit that a well-manufactured machete should not give you blisters or hurt your hands after excessive use. This entails a well-placed and textured handle that is both soft on the hands but still facilitates a firm and easy grip. It is designed with a well-layered nylon sheath that can be used to safely store the machete after use and when it has been properly cleaned out. The sheath is also perfect for carrying the sharp and attractive two-sided blade around especially if you will be walking/transporting a relatively long distance. The non-slip grip handle weighs 1 pound ensuring it is light enough to swing around, there is also a lanyard hole for easy and convenient attachment. The black 400- denier thick nylon sheath is great for all weather conditions and inclusively comes with belt loops to attach to your clothing. Make sure you also check our guide to the best camping knives. On looking at the SOG SOGfari 18” Machete MC02-N Hard cased Black Blade, its’ fine finish and expertly executed design is glaringly visible. It’s quite light and the handle is incredibly comfortable on the hands to ensure a more enjoyable and less strenuous user-experience. When using a tool such as the machete, the weight determines a lot, regardless of the task at hand; clearing surroundings, cutting down dry or dead branches, clearing vegetation and so on. It is important this tool is light enough, with a weight of about 15.7 ounces and a total length of 24 inches it is undoubtedly an appropriate weight for any high energy tasks you need to perform. The blade of this army machete is suitably crafted with high carbon steel and a thickness of 0.08 inches which is effectively perfect for clearing trails and simply cracking open a coconut. The SOG SOGfari machete is made with 3CR13 steel, coated with a fine black powder finish and with a saw that back measures 18 inches long. The well-shaped handle is made of Kraton with a rich black finish and rests perfectly in your hands. The handle is reinforced with a synthetic rubber material that ensures the machete will not easily slip from the hands while safeguarding against heat, chemicals and harsh weather conditions. In addition to its fine sharp form and appearance, the SOG included an actual functional saw at the top rim of the blade making this machete the must-have multipurpose blade. Its edges are sharp and hack in quite deep and on the back of the handle is a protracted spiked tang that can be effectively used for pounding or scraping. The SOG went a step ahead, including holes in the handle that can be mounted with ropes or cords. A black nylon sheath comes with this machete to both house and preserve it, with a belt loop and a hook and loop closure to enable easy attachment to your clothing for a hands-free experience when not in use. 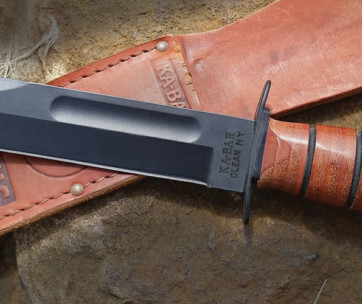 Our handy guide to the best Ka-Bar Knives features more great products like this. Whether you are preparing for a zombie invasion or just going for an adventure in a forested area, the Kershaw camp 18 (1074) Camp Series Machete 18” Steel Fixed Blade will make a great companion. 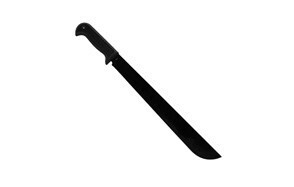 It features a coated fixed blade running along a fine full tang machete brilliant for use in a camp site or in a jungle. This sharp and functional blade is made with quality 65Mn steel and finished with a black powder-coat; it is quite an attractive looking blade. The blade is made from a top quality, high performing Chinese forged steel, manufactured to deliver outstanding resistance against wear and corrosion while providing extra resilience and rigidity. A machete should look good as well as carry out its functions efficiently and this high performance blade fulfils both criteria. The blade length runs long measuring at 18 inches; this gives you better stamina and swing-ease while hacking away at brushes. The make of a blade determines how durable and useful it will be as a cutting tool, the Kershaw camp was designed for more tough applications such as hacking down small trees. It is reinforced with medium-high carbon which significantly increases its strength and toughness ensuring it performs as a quality rugged steel blade. If we look back in time, the first machete manufactures took out the time to craftily put together a sharp and effective blade that would functionally carry out hard-core duties such as intensive clearing, wood cutting and tree chopping. In recent days, machete manufacturers such as Kershaw strive to maintain such expertise by developing smooth and even blades with a tough powder coating. This is achieved by heating fine powder on the blade to achieve a low reflection, less shiny but striking look while providing appropriate blade protection. A well-shaped and easy-on-the-palms handle is what the Kershaw Camp machete provides, made with solid polymer that is wrapped in a textured rubber overmold offering a comfortable form and a secure grip. It comes inclusively with a molded sheath that has lash spots and nylon straps that adequately protect the blade and make it less stressful to carry. Love this product? Check out our review of the best survival knives for our top picks. If you are looking for a blade that will be great when going camping, hiking or probably just clearing brushes in order to create more garden space, then stop by the Schrade blade. A sharp and swift blade will adequately assist with clearing out stumps, stones, and dead or dried branches getting in the way. The fastest way to create space and keep your garden, farm or trailways neat and tidy is by using the Schrade SCHKM1 19.7” Kukri Machete with 13.3” Stainless Steel Blade and Safety Grip Handle. This well curved and stellar looking knife tool is manufactured with authentic 3Cr13 stainless steel coated with powder to prevent corrosion. When metal is exposed to humid environments they can actually start rusting, a powder coating acts as a protective guard against such processes including corrosion and chipping. The blade itself measures 13.3 inches lengthy enough to cover enough ground, with a sharp and pointed edge perfect for gardening or splitting coconuts open at the top. The Schrade manufactures put in a lot of thought to this outstanding black coloured safety hold handle, suitably textured for an easy non-slip grip. The Schrade gives you more with its featured versatile polyester sheath, which is wear and tear resistant. The sheath provides a detachable shoulder pouch, leg strap, shoulder strap and belt loop for extra and expedient versatility. Some of the best features that come with this kukri machete are the ferro rod, sharpening stone and a lanyard hole. If you own a knife it’s commonly known that they have to be sharpened occasionally so the blade doesn’t end up blunt and not useful, the sharpening stone does just that. The Schrade manufacturers have got your back with a firm hand of steel; provided in this purchase is a ferro rod you can use to start a fire. When camping, hiking or on an adventure in the wild, the best way to start up a fire when rubbing two stones together fails, is using the ferro rod on your fine stainless steel blade. Find more great products like this by checking out our guide to the best pocket knives. This finely crafted machete was manufactured in Brazil, you will agree that the Brazilians know a thing or two and more about their blades being a tropical area itself. Without being tribal, the Tramontina blades have made quite a name for themselves, and a trial will convince you. The most common issues people may come across when buying machetes are using it for tough operations and ending up with a chipped or worse, broken blade. The Tramontina machete Wooden Handle Sword saves you the time and money while providing one of the most convenient whacking and swinging experiences via its sharp 24” blade. The length of it covers more ground especially if you are clearing out grass and weeds in your yard or garden. This machete goes traditional with its well-polished wooden handle that is sure to outlive a turtle! For some the wooden texture could come off a bit harsh on the hands, this can easily be solved by wrapping around some tape or rubber straps around it for a more comfortable hold. The craftsmanship of this blade must be commended, suitably forged with a long lasting and authentic carbon steel construction to ensure its durability. Carbon steel blades happen to last longer than other steel types thanks to its ability to withstand rust and corrosion. It is great for use since it’s able to have a more acute edge ensuring the blade doesn’t bend when it comes in contact with tough surfaces. You will also find the Tramontina’s blade quite easy to sharpen because of its exquisite make. This machete is the definition of a real blade for the real man/woman, with its’ perfect working abilities and excellent swing, you will be cutting away in all directions clearing all in your way. It also conveniently hacks away brushes evenly without setting in the blade first before the edge. You may also like to check our guide to the best utility knives. Talk about an uncommon combo? The Fiskars 29 Inch machete Axe merge these two most wanted knife tools together, because what a machete can do, an axe can do even better. One of the things the axe and machete have in common is being used to a large extent as a cutting tool. And while an axe is perfect for chopping down trees, cutting wood into pieces, among other functions, it also doubles as a fast clearing tool. If you are looking for a faster and more efficient way to clear out your garden or regular ground space, this machetes great form gives you the extra oomph you need to strike down on foliage with efficiency and agility. Its extra sharp blade is considerably shaped to accommodate an extensive range of tasks enabling a more fast-paced work advantage. Its brilliant physique allows you to conveniently use one hand to shave off shrubs and dead branches from trees and finely clearing out overgrown vegetation areas. One of the most phenomenal things about this blade is the all-round sharpened and functional blade that will have you using just one hand to finely clear brushes. The well sharpened knife-edge tip allows users to push up on ground and bark surfaces to shave off unwanted growth. In addition, the extra hardened curved blade enables a pull-cutting motion that will readily clear vines and remove suckers, staying sharp throughout. A lot of times after continuous use, a machetes blade gets blunt however the Fiskars saw blade reliably stays sharp and useful overtime. Forged with hardened steel, this blade is rust and corrosion resistant with a low friction coating that enables an excellent and non-abrasive cutting experience. The well forged and thoughtful handle is well put together; its’ finely textured pattern provides large hollows where your fingers will sit and smaller ones where the palm rests. Its comfortable design ensures utility of this tool will leave you without blisters after every use. The extended handle allows you the option of using one or two hands for added control over the length of the blade. Don’t forget to check our guide to the best karambit knives. This is without doubt one of the most money-saving machetes you will find out there, however before you take it out to split a tree in half, consider the functions it can suitably carry out first. The Whetstone Cutlery ‘Double Deuce’ Machete is readily engineered using stainless steel, it measures 16 inches long which is great when you need to cover more distance in one swing. Stainless steel blades are quite a common breed given that they provide a much needed tough and durable make. It is more advantageous when a blade is coated with fine powder and heated to drastically reduce the chances of corrosion. The Double Deuces blade is reinforced with a fine black powder coating that will highly guard against rusting and ensure the blade is durable. Regardless of the price of a product, it is only normal for you to hope it lasts long, with the double deuce machete be assured of its’ reliable longevity. For the price, it is quite a heavy duty machete you can take along on a ‘wild’ adventure, however when sticking to your comfort zone this tool will still expertly do the work. Starting from lightweight duties like clearing out the overgrown vegetation at the backyard or weeding the garden, the double deuce will have you saying bye to the foliage. This full tang machete has a good form, it’s lightweight and very comfortable on the hands to ensure a less stressful user experience. Most people undermine the need to have a suitable protective weapon in the house to scare off predators and maybe even zombies! A product of this calibre will adequately function as a defensive tool in case the neighbourhood gang decides to pay a visit. The need for a suitable, comfortable, easy-on-the-hands handle cannot be overemphasized, clearing brushes, hacking wood, harvesting crops are not exactly the easiest chores. No matter how Disney portrays easily and briskly going over chores, clearing, cutting and chopping would cost you some sweat! To ensure that this process only gets easier for you, a well textured handle with the right material is required. The Whetstone Machete features a rubber handle for an easy and non-slip grip. The Nylon Sheath comes fully providing a button closure and belt loop for improved transporting. 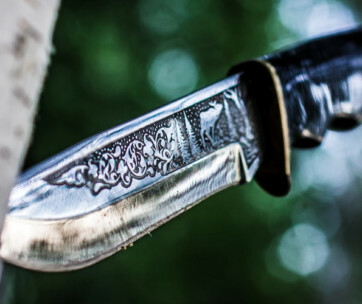 If you love knives, check out our guide to the best boot knives. The Ontario Knife Company 8683 SP8 Machete Survival 10″ Saw back Blade is one of the finest machetes you will find on the market, it also doubles as a saw blade, a blade of such excellence can be used for heavy duty tasks without concerns of the material chipping off or the blade bending. It was mainly crafted for military, sporting and rescue purposes, however, there is no law prohibiting you from using this outstanding blade for a wide range of tasks. Clearly one of such tasks isn’t using it on other people except they are zombies, then that’s okay. The Ontario knife is a high quality machete made of carbon steel with blade thickness of 0.250 inches, the blade is finely coated with a black powder finish. This ensures that this stellar tool does not suffer from undeserved rusting or corrosion during the time of its use. When clearing foliage or using this machete as a survival tool it may come in contact with moist surfaces, the carbon steel make and powdered finish ensures the blade doesn’t cave to weathering. A suitably constructed machete should have a convex bevel from the spine of the blade to the tip of it, this is enabled by a secondary bevel. This state of the art knife tool’s blade grind features a flat primary bevel with a similar flat secondary bevel. The handle is made with an easy-on-the-hands Kraton material that ensures a smooth and secure non-slip grip. The blade measures 15.20 inches allowing users to cover enough ground in one swing while finely taking care of shrubs. Without doubt, this carbon steel blade has a full tang construction reinforcing its strength, toughness and durability. To top it up, the sheath material is made from durable leather cordura and features a belt loop which can be attached to your clothing. Our guide to the best tactical knives offers more great knives so check it out. The material used to make a knife and the form of the blade will both tell just how efficiently one would work, the perfect machete would have to be intelligently crafted. The Gerber Versafix Pro Machete Knife Hybrid[31-003471] is a uniquely crafted tool that serves as a blade as well as a machete. The blade measures 9 inches while the total length is 14 inches, with a skeletonized weight forward form that is great for baton jimping. This particular machete is quite portable with a sharp and attractive compact design that swings powerfully to achieve its task with finesse. Do not be deceived by the size of this masterpiece, it packs a punch when hitting at shrubs, branches or wood pieces. 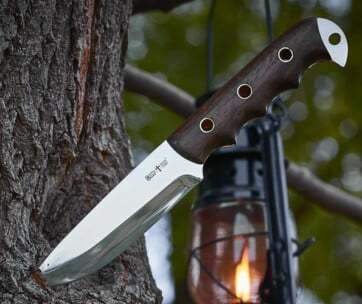 If you regularly go on adventures to forested areas this knife is a must have and its compact form is a major advantage as it will easily carry on. 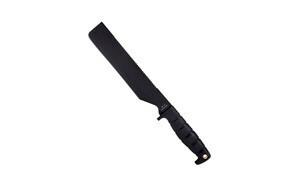 This machete features a full shank that is adequately attached to the handle to ensure extra durability for tough tasks. The curvy form has the weight of the blade more at the top ensuring that with swift and easy swings the overgrowth is completely tamed. For hard-core tasks such as batoning the Versafix pro actively serves as the perfect tool; its’ hard, tough body will ready split wood after a few knocks in. To make things even better, this sharp edged knife is made from stainless steel reinforced with photochemical etching that completely reduces the odds of this blade getting stuck. We have established that a great handle should be comfortable, firm and made from good, long lasting material that will lessen the odds of getting blisters. When talking about an excellent grip that facilitates getting the job done superbly, the phenomenal durometer overmold handle does the trick. Being crafted from both rubber and polymer be assured to feel like a pro when wielding this work of art; it goes a long way to reduce fatigue. You can’t talk about a good machete while avoiding its’ sheath, and a sheath has only lived a fulfilled life when it has capably served more purposes than one. Fully provided with a belt mount, backpack strap and a lanyard hole to keep this attractive, sharp mouthed companion close to you at all times. The sheath features a click-in system and quick release functions that provide easy access to the blade while keeping the sharp end of the blade safely packed in. This tool was smartly crafted in Portland, Oregon. Machetes have been used way back in history for effectively as cutting, clearing and chopping tools. To get the best out of one you need to understand its features and dynamics. Brand - It is great to give new products a chance, but where a longstanding, re-known sits, it would probably be attended to first. The brand of a product matters a lot, when it’s a household name that is known for manufacturing top notch products. The blades listed above were all selected because their brands stood out among others. Apart from being re-known by many, the make and manufactures were a strong deciding factor, when reading the specifications and features it is noticeable that only blades that were well manufactured from trusted sources were included. Reviews - A product is naked without a good customer feedback, when going through the reviews on the different products the feedback from customers who had previously purchased the tools listed above were highly taken into consideration. The machetes that got more positive customer feedback were selected to ensure many more users purchase a workable, durable and sustainable knife tool. Blade Shape - The shape of a blade highly determines how swift and fast the machete will swing; curved blades tend to add finesse when slicing through foliage and overgrown vegetation. Curved blades are more likely to have pointed and sharp tips which can extensively be used for a range of tasks. Flat blades are more lengthy and great for covering more distance per swing. Blade Material - The material used in crafting out the blade is extremely important, it determines how durable, sharp, sturdy and attractive the machete will be. Stainless steel and carbon steel are the most common materials used in manufacturing good blades. Most blades are reinforced with powdered coating to safeguard against rusting and corrosion. Length - The length of a machete varies, and while it does not determine how efficiently the blade will work, it does however decide the reach of the machete. A longer blade of 16-18 inches will cover more ground while an 8-10 inch blade will be more portable and easy to carry around. Short blades are still quite sharp depending on the make and brand and will expediently still get much work done. Handle - The handle of a machete should be well considered before purchasing one, the texture of the handle can either provide a comfortable grip or leave you with blisters and hardened skin. Wooden handles are better for a firm grip while rubber handles serve a more comfortable and slip-free purpose. Tang - A machete with a full tang is preferable for a more durable and sturdy blade. Thickness - The thickness of the metal will reduce the instances of bent blades or worse, broken blades. The thicker a blade is, the heavier it is likely to be. Sheath - The Sheath material has to be made of excellent quality, a sheath will readily protect the blade from humid and moist environments. And if you are on the move a mountable sheath will be greatly beneficial for better and more convenient transporting.